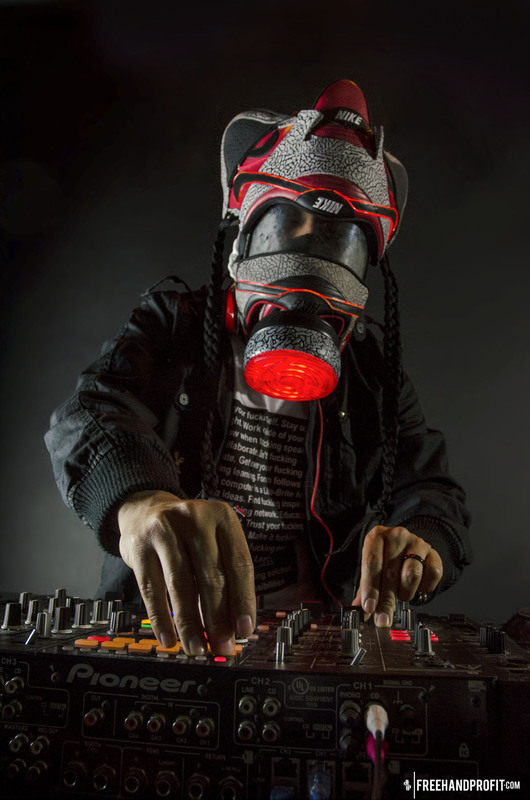 The 48th sneaker mask created by Freehand Profit. Made from 2 pairs of Supreme X Nike SB Dunk Lows (2002 & 2012). Find out more about the work on FREEHANDPROFIT.com. With functioning light wires and pulsing LED lined, elephant print banded canister – No. 48 was definitely one of my most ambitious masks at the time. Like the KD4 N7 Gas Mask it featured 2 color ways of the same shoe, this time spanning a decade of Nike SB x Supreme collaborations by dissecting a pair of 2002 Supreme SB Dunk Lows and a pair of 2012 Supreme SB Dunk Lows. The Supreme SB Dunk Gas Mask originally released alongside the USMC Combat Boot Gas Mask on July 1, 2013 (“Funny”, the sneaker blogs that featured the Supreme Dunk mask failed to mention the Combat Boot mask which I was auctioning off to benefit Wounded Warriors).